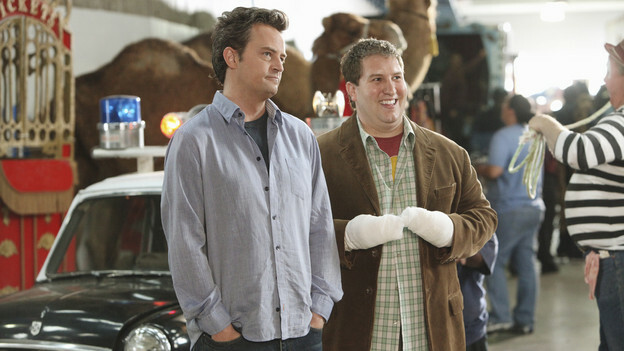 Matthew Perry (left) stars in the new ABC sitcom "Mr Sunshine," which looks at the life of an arena GM. America’s venue managers are finally getting their prime time due. The show is called “Mr. Sunshine.” It is written and produced by Perry, and has raised some good-natured eyebrows among San Diego venue managers. There is only one sports arena in San Diego, and it is aging, Hahn pointed out. There is only one manager who is 40 years old and going through some life changes. Hahn said he has had no involvement in the project, beyond talking to a location scout. ABC did not have anyone available to comment by Pulse’s deadline, press officials said. The network is working on an upcoming press junket to announce the show. In the trailer, the crew grapples with Ben’s 40th birthday, a circus elephant who has gotten loose in the arena, and finding a way to melt the ice floor. Zeidman is one who thinks this sitcom could be good for the industry. “It’s entertainment,” he pointed out. While AEG has been approached by Hollywood types about reality shows many times, those are always about issues going wrong. It’s not a reality show unless it’s problematic and that, to him, would likely be detrimental. An entertaining sitcom, however, could be fun. “I’m going to watch it,” he said. Other venue managers in San Diego said they were not approached about the project. Kolek said the trailer’s exterior shots didn’t look like a San Diego venue. “It almost looked like the old Forum in Los Angeles,” he said. Zeidman said he, too, thought he recognized The Forum, where he used to work, in the preview shots.